Are you and a group of friends or family members considering a trip to Spain all at the same time? Then you should consider a Spain group trip. While you're soaking up the Spanish sun and exploring the country's cuisine and historic culture, you can enjoy great discounts and extras that group travelers to Spain can access. Airlines, hotels and tour operators often give larger groups a package discount while traveling in Spain. And often it is possible for the group organizer to travel at a larger discount or even for free. Your Spain Group Travel plans can be prepared with as little or as much flexibility as you need. Be sure to think about you group - everyone likes a bit of independence now and then, but don't miss out on those great group experiences to make memories of a lifetime. It can be difficult to find a great travel professional that can assist you creating the ideal Spain group travel itinerary. You should work with someone who has first-hand experience with working with group itineraries as well as knowledge of the great local destinations in Spain itself. From the famous coastline of the Costa del Sol to the snowcapped peaks of the Sierra Nevada, Spain is a land of stunning contrasts. The country's history is entwined with the Moorish culture whose influence can be particularly felt in the cities of Cordoba and Granada through their architectural elements. Spain's passion radiates from its food and its flamenco style of dancing. This journey will ignite your passion for this Mediterranean land. 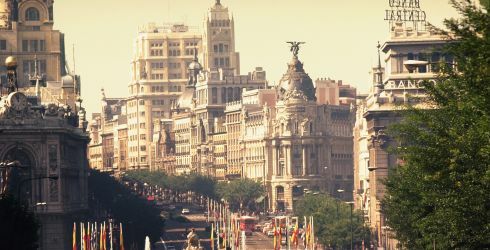 View the complete day to day Spain - Malaga to Madrid Itinerary. Experience Europe's fiery Latin cultures on this trip through Portugal and Spain. From the plaintive Fado music of Portugal to the Flamenco dancing of Spain, visitors will delight in visiting these capitals of Latin culture. See the influence of the Moors on castles and palaces. Be amazed at the breadth and quality of the artworks in the world famous Prado Museum. In Barcelona wonder at the bizarre but mesmerizing influence Gaudi had on the city. View the complete day to day Spain & Portugal - Lisbon to Barcelona Itinerary. Beaches, baths, artists and wine encompass this tour of Barcelona's best. Explore Spain's history of surrealism on a visit to the Sagrada Familia and the Salvador Dali Museum. Explore Roman archeological sites at Tarragona and the Arabian baths at Girona. Savor sparkling wine at the Penedes Valley wine region as you contemplate what a wonderful time you are having in Spain. View the complete day to day Ultimate Barcelona Itinerary.